To install and run ImageJ, download ImageJ bundled with either 32-bit or 64-bit Java, extract the ImageJ directory from the ZIP archive, change to the ImageJ directory and double click the "ImageJ" launcher. Use the Edit>Options>Memory & Threads command to specify the maximum amount of memory available to ImageJ, initially set to 75% of available RAM by the ImageJ launcher. To make more than 2GB available requires a 64-bit computer running a 64-bit version of Linux and a 64-bit version of Java. Use the Help>Update ImageJ command to update to the latest version of ImageJ. be in the ImageJ/macros folder if 'path' is not a full directory path. batch (no GUI) mode, passing it an optional argument. ImageJ exits when the macro finishes. Example 1: -eval "print('Hello, world');"
Example 2: -eval "return getVersion();"
Windows are blank or stacks are not displayed correctly on Ubuntu with compiz enabled. Disable all effects in System Preferences > Appearance > Visual Effects. ALT key does not work. "Alt" key issues in KDE may be related to default key assignments, which can be changed. In KDE, go to System Settings>Window Behaviour>Window Behaviour (again)>Window Actions, then change the "Modifier key" from "Alt" to "Meta". KDE will then use the "Windows" key as the modifier and leaves the "Alt" key available to ImageJ. This JAR (Java Archive) file is the platform-independent core of ImageJ. It is the only file changed when you upgrade using the Help>Update ImageJ command. This is the ImageJ launcher. This folder contains the 32-bit ot 64-bit Java 1.6.0_24 runtime from Oracle. This folder contains example macros. The StartupMacros.txt file in this folder contains macros and macro tools that are automatically installed when ImageJ launches. To run a macro, drag and drop it on the ImageJ window and run it by pressing ctrl-r (Macros>Run Macro). This folder contains a small sample of the hundreds of plugins available for ImageJ. The plugins in this folder are installed in the Plugins menu when ImageJ starts. This folder contains LUTs (LookUp Tables) that are installed at startup in the Image>Lookup Tables menu. Use the Image>Color>Display LUTs command to view all the LUTs in this menu. This folder contains images used by ImageJ, such as the ImageJ icon (icon.png) and an optional custom cursor (example). 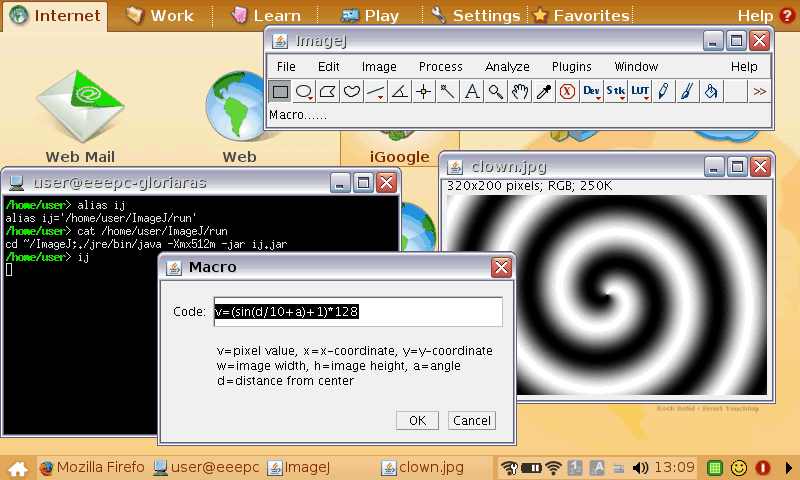 This screenshot, created by pressing shift-g (Plugins>Utilities>Capture Screen), shows ImageJ running on a Linux netbook with a 800x480 screen, 512MB RAM and 4GB SSD.